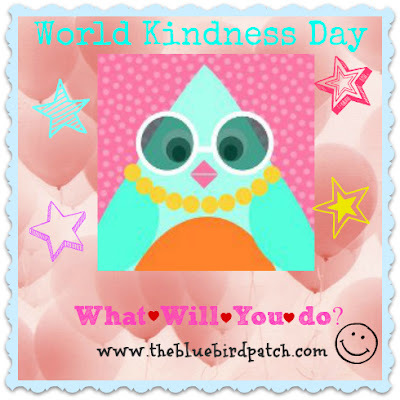 World Kindness Day November 13 - What Will You Do? Did you know World Kindness Day is today? This was the opening day of the first World Kindness Movement® conference held at Tokyo in 1998, and the 35th anniversary of the Small Kindness Movement of Japan, which brought the signatories of the ‘declaration of kindness’ of the World Kindness Movement together in 1997. The idea of a World Kindness Movement was conceived at a Tokyo conference in 1996 when founders of the Small Kindness Movement in Japan brought together like-minded individuals from around the world who had started kindness movements in their own countries. They were led by Dr. Wataru Mori, a physician in Tokyo, who envisioned that a more compassionate and peaceful world could be achieved if a critical mass of acts of kindness was ignited. Kindness have amazing power and the more we use it, the stronger we become. Franklin D. Roosevelt once said: "Human kindness has never weakened the stamina or softened the fiber of a free people. A nation does not have to be cruel to be tough." On World Kindness Day, choose to be kind and change the world. Remember!! You CAN change the world one random act of kindness at a time!